The first and most important for the owner of the shop - profits arising from business income. Currently widely: the highest yield from a square meter of sales area is achieved in the stores with self-supermarkets. Hence the desire of the owner of the shop in this way to organize his work. 1. The server database stores all data on the shop (chain stores). Data are continuously updated, added new - it is important to ensure high performance and reliable access from all the jobs the shop (chain stores). To do this job databases online version TCU organized on the basis of SQL-server (including Microsoft SQL Server). For a store to install MS SQL Express (restriction of the database up to 4 GB), which is distributed free of charge. Provide free version of MS SQL database volume is sufficient to store data for 1 - 5 years, the number of titles in the 5-10 thousand Everything depends on the number of sales (data checks), parishes / expenses, and other things. After filling in all the allowable level of SQL-server, you can remove the (pre-make a backup copy) the old record - a year or more - and continue to work. Detailed Outline of the database server (hereinafter database) is shown below. fixed cost savings (low budget) you can combine the database server and workstation. The following is a budget version - both a server job. This allows you to save on the cost of a PC, but reduces the speed of the server - the option of work is avoided! 2. At a regular job (based on TCU version «TCU Network» - «TCU Ultra») can be the introduction of a new product, posting goods received from the supplier, as the mutual interaction with suppliers and any other contractors. 3. workplace cashier (or Cash ) can be organized on the basis of any PC or laptop. 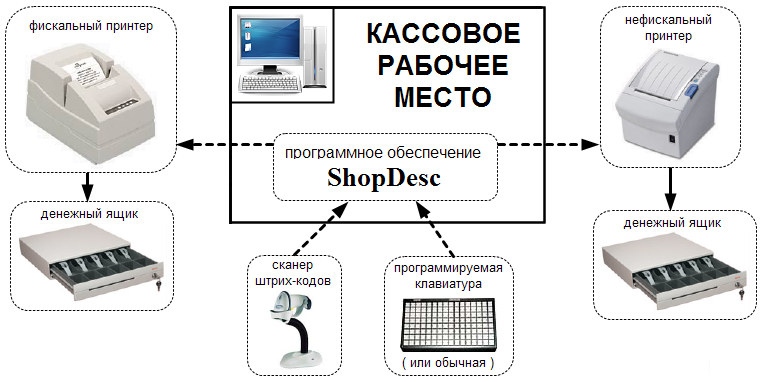 It is desirable to equip the workplace of the cashier a special keyboard (keyboard programming). Programmable keyboard is more durable than conventional (it is designed for a long period of intensive exploitation), and may also be reprogramme the commission of various acts in a sequential pressing. cash job done with the scanning of goods recorded in the "check" and the introduction of quantity, printing checks, receive cash. Ukraine in small shops and supermarkets, liquor-vodka department, usually reserved for a separate legal entity. It is connected with a particular tax policy. Shop from the main food group is not a VAT payer, a liquor-vodka Division, attached to another entity, is a VAT payer. As is typically solved this problem? In TCU3 record total food and liquor group and vodka group conducted at selected outlets that entirely legitimate. Each outlet has its own tax details, and often different owners. Workplace cashier ShopDesk configurable access to both outlets. One of them (liquor-vodka products) is configured as a «tax». If the buyer acquires only common food products group, only the non-fiscal receipt is printed with the amount of purchase. If a buyer acquires goods and general food groups, and liquor-vodka products, tax receipt includes only «liquor-vodka», a non-fiscal check includes all the goods - and «liquor-vodka», products and general food groups . In this case, the buyer is a general check (non-fiscal) for the full amount of purchase, and attached to the tax check. other words for a cashier job (his desk, cash box), it is possible to register the sale as one outlet (fiscal products, fiscal receipts) and the other outlet (non-fiscal products, non-fiscal receipts). When the number of «combined» legal retail outlets is not limited. only condition (at least in Ukraine): at each outlet with VAT => a fiscal printer (fiscal recorder) - the requirements of the legislation.